The documentary film, Sweetgrass, by Ilisa Barbash and Lucien Castaing-Taylor, captures a year in the life of a sheepherding family in the Rocky Mountains of southern Montana. The film is a tribute to a way of life that has passed into history. After four generations of driving their flocks into the Absaroka Beartooth Wilderness, the Allested family sold the ranch near Big Timber along with the sheep. With no voice-over narration or background music, the filmmakers let the images and natural sounds speak for themselves. Sweetgrass opens in winter with scenes of a herd of sheep grazing in snow-covered fields accompanied by the sound of wind, sheep munching their food and the clanging of the bell on the bellwether. It progresses through shearing into the spring lambing season. The heart of the film follows the 150 mile trek of the sheep into high mountain pastures and stays with the herders through the summer months. The beauty of this rugged country is juxtaposed with the unrelenting hard work of tending the sheep and keeping them safe from bears and wolfs. By using radio microphones to record the sheepherders, the filmmakers reveal their inner thoughts as they go about their lonely business. 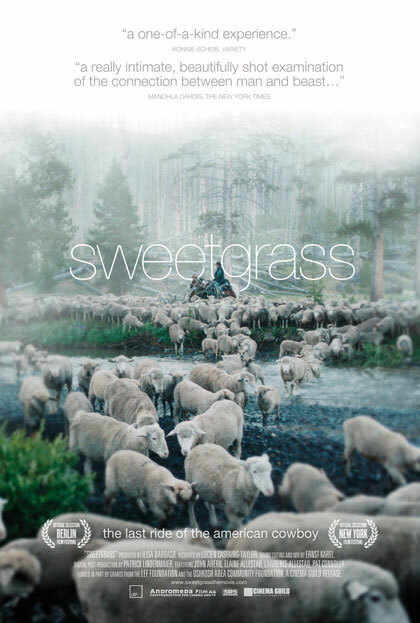 One of the most memorable scenes in Sweetgrass is a long shot of a green pasture dotted with sheep. The camera remains motionless and the ambient sound is the peaceful chirping of birds and a gentle wind. The baaing of the sheep is heard softly from a great distance. Even though it is hard to see the sheepherder, his voice is recorded over the scene as he tries to move the sheep up a slope. He is angry and frustrated with the herd and swears at them in language that is seldom heard in the movies. It was almost painful to listen to. That scene is by followed a close-up of the same herder talking on his cell phone to his mother complaining about his loneliness and his aching body. The film ends with the sheep being driven back down the mountain. The contrast in mood with the scenes in the mountains is striking as the herders sing to their flock gently encouraging them to keep moving. Sweetgrass is available to rent from Netflix. Click here for the Sweetgrass website.